Journal of Singing welcomes contributions on all subjects relating to the voice, such as—but not restricted to—structure and function, history and literature, scientific and laboratory research, performance, care and nurture, and current and historical pedagogy. All articles become the property of National Association of Teachers of Singing, a nonprofit organization. Authors receive no compensation for their submissions. It is assumed that no article has been submitted simultaneously to or has appeared in another journal. 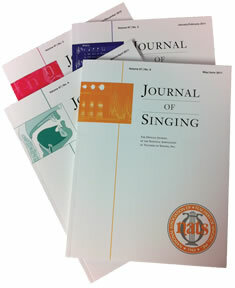 Articles submitted to Journal of Singing are forwarded to the Editorial Board for evaluation, a process that may last up to six months. The Board is made up of eight members of the Association chosen for their expertise in a variety of voice-related fields. Upon completion of the peer review, the Editor in Chief makes a final decision concerning publication. Three courses of action are possible: (1) the article is accepted as submitted or with minor emendations; (2) the article is returned to its author for revision; or (3) the article is rejected. A submission should be of topical interest to a significant part of the widely varying constituency served by the periodical and advance the literature in its particular subject area. The latter criterion may be addressed by synthesis, amalgamation, or critical examination as well as by original research. The article should be well organized with a clear statement of purpose in its introduction. Where applicable, it should contain a review of the literature and should include a list of selected references appropriate to the subject area. Great care should be exercised with written style and form and in use of language. First-person pronouns should be avoided unless they are essential to the nature or content of the article. Each article submission should include a completed Author Affiliation/ Permission to Publish form. Download the Author Affiliation/ Permission to Publish form. This is a printable, mail-in form. Richard Dale Sjoerdsma, Ph. D.